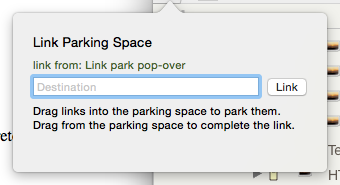 This pop-over is shown when the link parking space is clicked. It allows rapid completion of a link, especially to a destination not currently visible in the view pane. To set the destination note, type in the input box. As the user types Tinderbox offers autocomplete solutions to speed the process. Once the destination is entered, click the 'Link' button to create the link. The Create Link dialog is then shown to configure the link. If choice is wrong, click the Escape key to cancel the whole process. Take care if linking deliberately to aliases or notes whose title is a duplicate of other note(s) in the document. In such cases it is probably better to use the drag/drop method of link creation to ensure the correct destination item is selected.